Vancouver, British Columbia – A.I.S. Resources Limited (TSX: AIS, OTCQB: AISSF) (the “Company” or “AIS”) is pleased to announce that the final TEM Geophysics report from Quantec with detailed analysis of the TEM profiles has been interpreted. Two major aquifer structures based on low resistivity values have been identified. During this past week (1-6 October, 2018) Phil Thomas, Exploration Director and CEO undertook a 20 trench sampling program using a 321C Caterpillar excavator to trench down to 5 metres at each point selected at the Salinitas JV Project in the Salinas Grandes Salar, Salta Province, Argentina. Ground water and brines were encountered in 19 out of 20 trenches. Ulexite (boron mineral that frequently occurs with lithium) was encountered in several trenches and was evident in an area approximately 1000sq m near trench 19. The objective was to identify the types of sediments close to the surface with a specific resistivity and identify the porosity of this unit, e.g. stratigraphic units of green grey clays, sand, black volcanic sands, black shales or brown clays. The black sands/aggregates have a porosity of 22-32% +/- 3%. Preparations have commenced to start a drilling program in the next two weeks subject to drill rig availability (which is estimated at 10 days). Some drill pad preparation was completed, and roads have been upgraded using the 321 Cat excavator. Drill rig fluid pits have been dug at trench site 12 and 18 in preparation for drill hole 1 and if successful drill hole 2. The above 1D model at 2.5 Hz shows the two very low resistivity areas at a depth of 300-500m. The black sands/shales/gravels were encountered trenching at UTM 802000 which is the relationship we were seeking to correlate. The geophysics data was changed to 0 to 20 ohm-m, rather than 0 to 100ohm-m, and was modified to better highlight zones of very low resistivity, and to better differentiate the resistivity within the 0 to 10 ohm-m range. The above shows a very low resisitivity zone, possibly a lithium rich aquifer in black volcanic sands given the trenching correlation. The red triangle is the trenching locations. Above is the second zone of low resistivity, where there is large area approximately 2km wide by 150 metres in thickness in what is interpreted to be paleo channels. FIGURE 1 LEFT – Shows the significant amount of brine that flowed into the 5m x 4m x 4m pit some 36,000 litres within 18 hours. FIGURE 2 RIGHT – Shows the cat 320 trenching in the distance across the salt pan. FIGURE 3 LEFT – Shows the transition from the green gray clay possibly montmorillite with black sands/shales/agreggates starting to show through with water seeping immediately. FIGURE 4 RIGHT – Shows the black sands/shales unit with brine/ground water flowing into it. 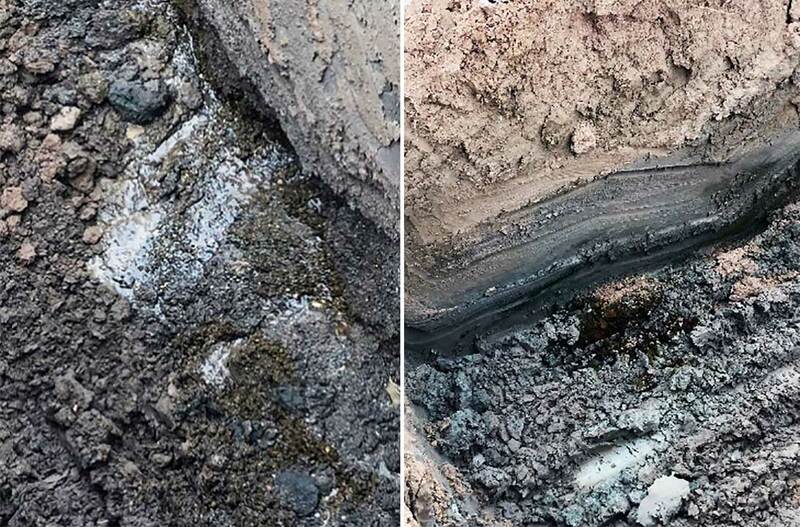 Phil Thomas, Chief Executive Officer and exploration director of A.I.S., stated: “Our trenching program has been a resounding success and enables us to drill with some confidence. We have identified black sand/shale/aggregate units containing gravels that have very low resistivity and the same resistivity signature will have a high probability of being encountered when drilled at 250 metres with units as thick as 150 metres. I am looking forward to the brine analysis to see the surface brine composition although it will have little relativity to the brines at depth where they will be more concentrated. Drilling is going to be exciting as we expect the aquifer flow to be substantial.” The Salinitas Project with MGX (CDN:XMG) is a joint venture where MGX have agreed to fund $1.2 million in works for an 80% interest over the next two years. Subject to brine composition and flow rate a production well will be drilled in either drill hole 1 or 2 for a 30 day pump test.